Everyone likes that light, fluffy, sweet-smelling stuff we call "cotton candy." With our machine you make your own! Yes, it's the same as what you might have at the "fair." It pairs great with any of our Inflatables and it's easy to make too! 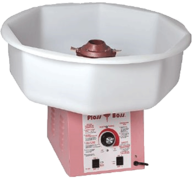 Kids and adults alike just love our cotton candy maker. Our machine can make enough cotton candy for a few people or a huge crowd! It's sure to be a hit at your next event. We also have in stock a variety of flavors, bags and cones.